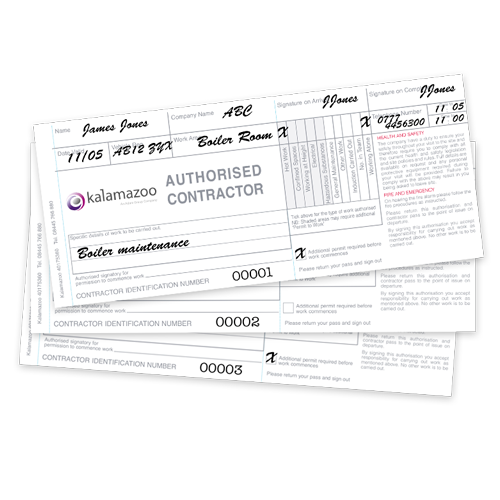 Kalamazoo's personalised contractor passes are designed to enable you to effectively manage your contractors. Contractor pass refills are sold as 10 overlapped passes with journal sheet and a discretion sheet and are used to record visitor information upon arrival at your premises. Contractors are issued with a pass which they must display at all times, allowing authorised contractors to be easily identifiable. To be used with the Kalamazoo Contractor Pass Display Book (sold separately). This product is suitable for any organisation with contractors working on site. Each pass can be detached and slotted into a PVC pass wallet, allowing you to keep track of visitors and contractors on site. Personalised passes help to enhance the profile of your organisation by creating a professional first impression. Kalamazoo's personalised contractor pass system is designed to enable you to effectively manage your visitors and help your organisation fulfil its Duty of Care. Duty of CareEvery organisation has a legal obligation to implement reasonable measures to ensure individuals, including staff and visitors, are protected from harm whilst on the premises. On the reverse of the pass, your specific health and safety guidelines and procedures are provided for contractor use, helping to ensure they are kept safe whilst on the premises. Kalamazoo's personalised contractor passes are design to fit into the Contractor Pass Display Book, which provides a professional solution ideal for storage on your reception or front desk. For an extra-enhanced, corporate image, your Contractor pass Display Book may be personalised with your organisation's logo in gold or silver foil.